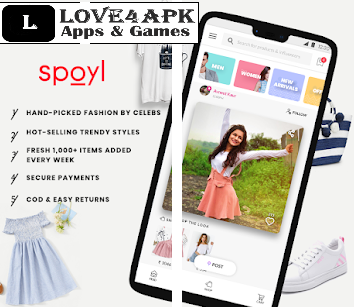 Spoyl Apk: Get access to the most famous fashion stores where you get handpicked items at great prices and discounts. Unbelievable but true. At Spoyl, you get fashion picks from the best styles. On Spoyl, you can be a seller too. The app lets you sell anything from fashion, books, beauty products, bags and much more. Spoyl is a free android shopping app and you get the best from over 1000 fresh styles which are added every week. You too can join the community of Spoyl Influencers and make up to 1, 00,000 every month. First of all you are required to submit the application. The app will need some basic information to get you started in this field. Once your application is approved, the app will create your free online store. Now you can start adding products to your online store which will define your style statement and choose the items across the categories. You can include Women’s kurtis, tops, tunics, dresses, jeans and men’s casual shirts, jeans, chinos, and many such categories. After you have added products to your online stores, the app will handle everything like from sourcing high-quality products to safe and secure payments and also you need not worry about the shipment of the products which will also be take care by the Spoyl. You simply need to share your products with your family and friends with the help of social media. You have to keep on sharing the products regularly in order to increase your visibility. Every sale you make you get commission for it. Spoyl Apk is not just about buying and selling but actually it is an innovative way to sell and in simple ways. There are millions of people who love this app. Now let us look into the benefits of the app. When you are buying more, you are actually paying less for it. This means your cart value goes down with an increase in quantity purchased. You get great quality products and latest trends. The sourcing team makes sure about supreme quality products from the biggest brands across the country. Get trending and high quality products at factory prices. You can also earn if you become a Spoyl Influencer. Make more from the comfort zone of your home by having more than ten thousand followers. Now after you have become a Spoyl Influencer, you not only influence your followers but also millions of other fashion trendsetters across the country. There is also an option to pay cash on delivery or make online payments. And once the product reaches the customer, you can get the commission in your Spoyl account. If you are not satisfied with the product or if your customer wants an exchange, there is also an option for it. You can easily return the item. You get timely customer support round the clock and they are always ready to help you if you are in a fix. So why wait more. Get the app downloaded now.